Posted on 10, May 2016 by EuropaWire PR Editors | This entry was posted in Automotive, Environment, Non Profit, Switzerland and tagged Didier Leroy, Inger Andersen, IUCN, Red List of Threatened Species (tm), The The International Union for Conservation of Nature, Toyota. Bookmark the permalink. Gland, Switzerland, 10-May-2016 — /EuropaWire/ — (IUCN) The International Union for Conservation of Nature (IUCN) and Toyota Motor Corporation (Toyota) today announced a five-year partnership to provide funding to broaden the scope of The IUCN Red List of Threatened SpeciesTM. This will significantly increase knowledge on the extinction risk of more than 28,000 species, including many that are key food sources for a significant portion of the global population. With our planet experiencing extinctions at the fastest rate in its history, IUCN and Toyota believe that there has never been a greater need to understand the current status of the species upon which our survival depends. This new knowledge will provide a roadmap to guide conservation – concrete action which could positively affect the livelihoods of hundreds of millions of people worldwide. Toyota’s support for the IUCN Red List is the first project to preserve species to be implemented under the company’s scheme to reduce the environmental impact of automobiles, the Toyota Environmental Challenge 2050. This year alone, the company will provide grants amounting to approximately US$ 1.2 million toward the project. The IUCN Red List assesses the risk of extinction of wild species based on past, present and projected threats. To date, 79,837 species have been assessed and more than 23,000 have been found to be threatened with extinction. The collaboration with Toyota will enable at least 28,000 more species to be assessed over the next five years. 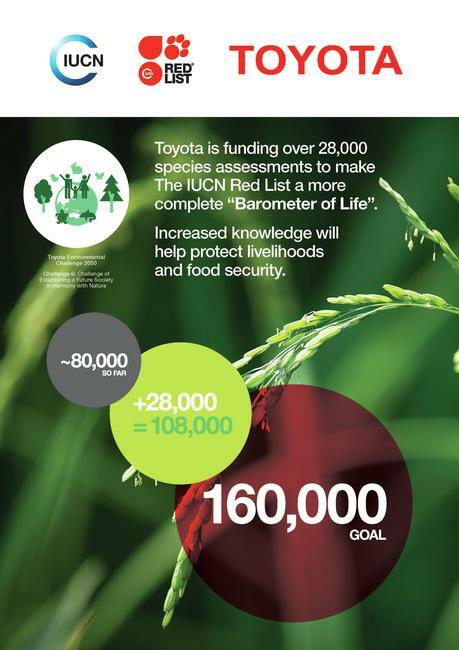 Toyota is keenly aware of the importance of biodiversity in achieving sustainability, and has taken substantial steps to preserve and support plant and animal species around the world. In order to address these and other key environmental issues, the Toyota Environmental Challenge 2050 was announced in October 2015. The program aims to reduce the negative impacts associated with automobiles to as close to zero as possible, whilst simultaneously making positive impacts on society. In order to help establish a future society in which humans live in harmony with nature, Toyota plans to globalize its long-running environmental grant program, and to create environmental preservation projects in collaboration with organizations that engage in such activities on a global scale. IUCN experts have chosen to focus much of the newly funded research on the populations of plants and fish that billions of people depend on as a vital source of food. These will include species of wild rice and wheat that are crucial to food security because they are the source of genetic material used to increase the yield, fertility and resistance to disease of staple crops produced by farmers across the world. Additionally, marine fish, such as sardines, pilchards, sole and plaice will be assessed. They are not just a source of food for billions the world over, but catching and processing them also provides work for an estimated 200 million people worldwide. The new grant will also be directed to work assessing other economically important plants, fungi, freshwater fish, reptiles, and invertebrates such as dragonflies, as well as upgrading the web platform used by more than 3.5 million people a year to access data on The IUCN Red List. Furthermore, the grant will support IUCN in carrying out activities to improve awareness about biodiversity. IUCN is a membership Union composed of both government and civil society organisations. It harnesses the experience, resources and reach of its 1,300 Member organisations and the input of some 15,000 experts. IUCN is the global authority on the status of the natural world and the measures needed to safeguard it. The IUCN Red List of Threatened Species™ (or The IUCN Red List) is an invaluable resource to guide conservation action and policy decisions. It is a health check for our planet – a Barometer of Life. It is the world’s most comprehensiveinformation source on the global conservation status of plant, animal and fungi species. It is based on an objectivesystem for assessing the risk of extinction of a species should no conservation action be taken.